MahaTET Result, Score Card Download 2018 For Paper I & Paper II: Maharashtra State Council of Examinations has organized the Teacher Eligibility Test (TET) examination on 15th July. The MAHA TET examination was conducted for Paper 1 and Paper 2. Many of the aspirants seeking to become teachers for the primary and secondary level in the state of Maharashtra have competed for the Maharashtra TET examination this year. Candidates qualifying the Maharashtra TET with good merit will be shortlisted for teacher posts in various private, government, and aided schools of Maharashtra state. Aspirants will get good pay scale. While the aspirants competed for Maharashtra TET examination have recently checked the MAHA TET answer keys and estimated the score. 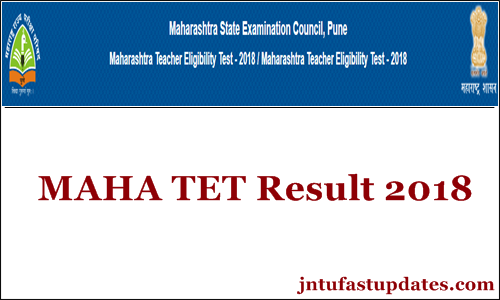 The Maharashtra TET results released . Candidates competed for MAHA TET examination on 15th July can now download the result from mahatet.in website. Stay checking the official Website, mahatet.in to check the result date. Along with the results, cutoff marks, merit list will also be made accessible by the MSCE. Maharashtra State Council of Examination annually conducts the Teacher Eligibility Test for B.Ed/D.ed qualified aspirants. Lakhs of hopefuls appears for the Maha TET examination every year. This examination is particularly conducted for the aspirants wishing to become primary/secondary school teachers in the state of Maharashtra. The application process for MAHA TET was held from 25th April to 22nd May. Lakhs of hopefuls have applied for Maharashtra TET examination this year. Applicants of Maharashtra TET will be shortlisted on the basis of Merit of MAHA TET Exam and will get the opportunity to work in various locations across Maharashtra. Maharashtra TET has announced the notification to recruit eligible personnel for Teacher Vacancies of categories, Lower Primary Classes Teachers, Upper Primary Classes Teachers, Higher Classes Teachers, Language Teachers, Specialist Teachers and Physical Education Teachers. This examination will be held for Paper 1 ( for Primary classes I-V) and Paper II ( For secondary classes VI-VIII). The Maharashtra TET examination was held on 18th July for a huge number of aspirants. Name of the Examination Teacher Eligibility Test. Total no. of vacancies available Various. Starting date for online applications 25th April 2018. End date of the Applications 22nd May 2018. Selection Method Written Test and Interview. Admit Card Issue date 2nd July 2018. Written Test Date 15th July 2018. Candidates competed for the Maharashtra Teacher Eligibility Test have to score the qualifying marks/cutoff marks mentioned as below to qualify the examination. Candidates competed for Maharashtra TET examination can check MAHA TET Category-wise cutoff marks from the following. The Maharashtra State Council of Examinations (MSCE) is released the Maharashtra TET Paper I and Paper II results on 2nd october. As per the updates, the Maharashtra TET results are expected to release after 3 to 4 weeks of the examination date. Hence the MAHA TET results in 2018 are anticipated to release in october 1st . Competitors will have to wait until the result date is announced. How to Check Maharashtra TET Results 2018 Online? On the homepage MAHA TET Results 2018 link appears; click on it.